BentoLunch.net - What's for lunch at our house: Finally Friday Lunch! Faith finished off assorted groceries for her lunch today. 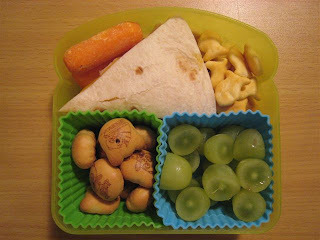 She had turkey & cheese quesadillas, some parmesan Goldfish, baby carrots, grapes and panda cookies. I need to grocery shop soon, but at least we aren't wasting much! You make the yummiest, coolest lunches. Where do you get the cookies? Every time I see them, I get hungry. Thanks.